We planned to stay in Phnom Penh, the capital of Cambodia, for a week. I booked us a room at an Airbnb that sounded like a nice homestay with a couple of foreigners with a spare bedroom. But our stay was cut short. More on that later. We arrived in Phnom Penh at dark and caught a taxi from the airport to the middle-class house where we were staying. On arriving, our host Alex met us and gave us a walk through of the place, and then left to return to his own home. Yes, this was another Airbnb where someone who has a house is renting out every bedroom, as a sort of unlicensed hotel. He said he would be available by text message if we needed anything. There weren’t any restaurants right around the place, so our host recommended ordering out. There’s a website that lists places that deliver, mostly Western food. So I registered for the site, found a place, and put in an order. It was supposed to take an hour. Ninety minutes later, the food still hadn’t arrived and nobody called us. When I called to talk to the restaurant, they told me to call the delivery service. When I called the delivery service, they said they would call the driver and call me back. They didn’t. So Beth set out in the dark on foot (something that we learned the next night was foolish) and gathered up what food she could find from a nearby convenience store: two cold hot dogs filled with cheese (no buns), a can of Pringle-like chips, and some candy coated peanuts. We were both hangry and tired, but we ate because that’s all we had. Of course about 20 minutes later, the doorbell rings and it’s the delivery driver with our order we placed two hours ago. He was very apologetic, but didn’t speak enough English to explain what the problem was. So we took our second supper, and I paid him. It was an inauspcious start to a weird stay. The next morning, we had a similar problem. The Airbnb didn’t serve breakfast, and we didn’t know where to go to find anything to eat. We weren’t in a real urban area like in Bangkok, where you can walk in any direction and find food. Also, the lock on the front gate protecting the house was really weird, and I couldn’t figure out how to open it to get back in. So Beth stayed in the house while I went to forage. I found a place at the end of the street and clumsily ordered a breakfast of two plates of rice, one with a chicken leg and one with egg and pork. I also got a little plastic bag of chicken (???) soup and four things that looked like a cross between Olive Garden breadsticks and Indian frybread that I learned you’re supposed to dip in the soup. Oh, and two iced coffees. That morning, Beth talked by phone with a nurse who had been caring for Beth’s father. The nurse said he probably only has a week to live, and that if we wanted to see him alive we should come home immediately. But like I said, more on that later. With that sobering news, Beth did some quick travel planning to figure out how to get home ASAP. Then we walked to a “Western” restaurant, which turned out to be a vegetarian Indian restaurant. We had a good meal, then walked to the Genocide Museum. Here’s me hamming it up at the restaurant where we had lunch. 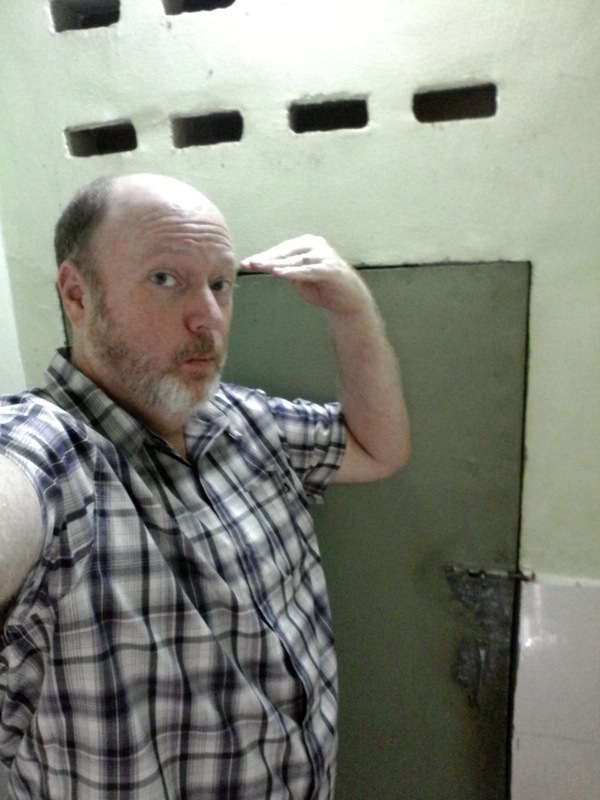 The door to the toilet only comes up to the bridge of my nose, so anyone taller than about 5′ 6″ has to hunch to get in and out. 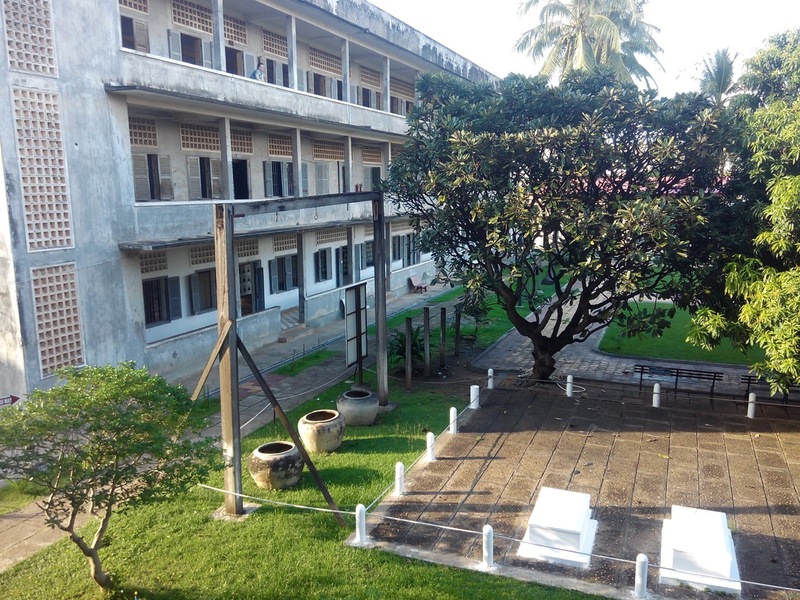 Before it was a museum, this was a prison camp and torture facility used by the Khmer Rouge in the 1970s. And before that, it was a high school. Pol Pot, in his big anti-intellectual wave, banished public schools and turned this one into a place to hold intellectuals and other suspicious people, torturing them until they “confessed” to being capitalist sympathizers. Many died during torture. The rest were executed after torture. We learned a lot about the Khmer Rouge, the torture methods, and the history of the country before and after. One thing I didn’t realize is that the Vietnamese were the ones who invaded Cambodia to put an end to the regime. That’s right, the same Vietnamese that Americans said were evil communists and must be stopped otherwise all of southeast Asia will fall actually toppled the evil communists of Cambodia. When Phnom Penh was liberated by the invading Vietnamese, the prison camp guards killed the twelve prisoners who were currently being tortured. 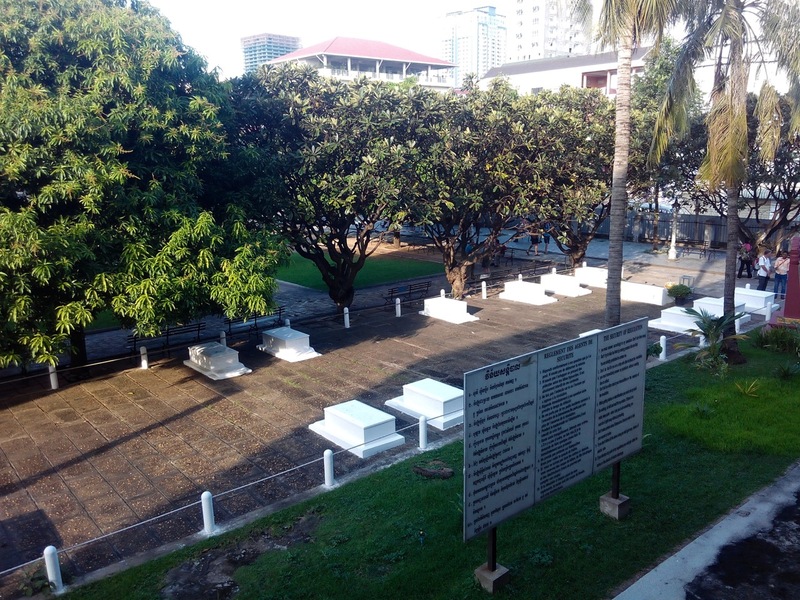 These white graves represent those whose bodies were left in place in the torture equipment. Photos of those twelve make up one of the most memorable parts of the museum. The prison camp was originally a high school. Here you can see one of the three-story school buildings. The classrooms were converted into cell blocks and torture chambers. Outside, the wooden structure that had been used by the kids to play games was now used to suspend prisoners face down in these urns of water during interrogation. We stayed at the museum until it closed, and then took a tuk tuk to the cinema where I thought the Phnom Penh Film Festival was showing. It had a restaurant and bar, so we had supper there. But it turns out I led us to the wrong cinema. There are three in this chain, and the festival is at one of the others. So then we caught another tuk tuk to the correct one. This one, sadly, wasn’t as nice as the first one, and we had an hour and a half to blow before the film started. We saw a short documentary about a guy who rides his bike across India to raise awareness and money for leprosy prevention and treatment. And then the feature was “Teddy Boy” which was produced in my home state of Colorado by a friend of mine named Sean Jourdan. I think it was his international premiere, at least for this film. We got in for free thanks to the filmmaker pulling some strings. It was a tiny place, only holding about 20 people. But it is a good venue for expats to watch Western films, since they have beer, cider, popcorn, and aircon. The cinema was only about four blocks from our Airbnb. Not knowing any better, we just decided to walk home. That’s when we almost got mugged. A pair of motorcycles, one with two guys and one with one, zoomed up from behind us, almost running into Beth. She shouted in alarm. After they passed, they got to the next intersection and then turned around, then came back. It turns out they were sizing us up, sort of like sharks circling prey. Several times they would zoom past. I think they were hoping they could get Beth’s purse, but she wears it across her body almost all the time, which makes purse snatching difficult. Once we realized what they were doing, we would make a false turn down a side street after they passed, forcing them to turn down the side street. Then we’d circle back. There was nobody else on the street after dark; no safety in numbers. But then we got to a bigger street where there was a tuk tuk driver asleep in his passenger car, and several family members standing around chatting. Once we stood near them, the motorcycle gang left and didn’t come back. We hoofed it the rest of the way to the Airbnb. I was shaking, and could barely unlock the security gate leading in. But they didn’t follow us. All the people staying in this Airbnb flophouse have a Facebook group, and I posted something to it to let people know what happened. The response: don’t go out after dark here, dummy! OK, good to know. Earlier in the day, Beth had booked travel arrangements to Kansas City, leaving first thing the next morning. I originally was going to stay another few hours or a day or something to plan out how I would get back. I had to go to Bangkok first, where I had left my iPad for repairs and where my new iPhone was being shipped from the states. So we knew we would be traveling back separately. I wanted to go with Beth to the airport, for moral support and also to make her feel safer given our experiences the night before. But after a mostly sleepless night, I decided I might as well just check out at the same time and stay at the airport, rather than spending another 90 minutes in a car or tuk tuk. I found an actual taxi cab service that will pick you up in the city (which most of them don’t; they only pick people up at the airport and drive them to the city), and had him come take us to the airport. Beth flew out of Phnom Penh for Taipei, and I flew out for Siem Reap. I had decided that after going through all the hassle to get to Cambodia, I’d really like to go see Angkor Wat, even for a day. That way I wouldn’t ever feel like I need to come back. The one day in Phnom Penh was enough for me, and one day touring Angkor Wat and the other temples in the area would also be enough. I’ll tell you more about that in another post, with lots of photos.